Filmmakers Chris Overton and Rachel Shenton. 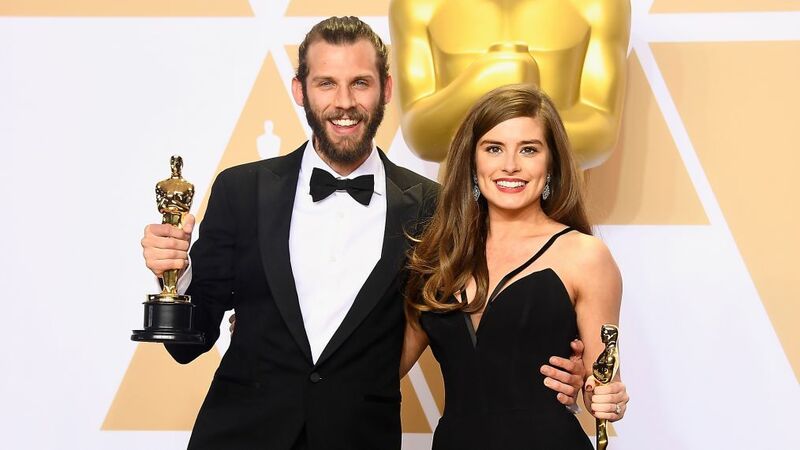 Oscars acceptance speeches have come in many forms over the years, but Rachel Shenton's 2018 version was one for the books. On Sunday night, Shenton and Chris Overton won Best Live Action Short for their film, The Silent Child. And when they took the stage to accept the statue, the British beauty caused waves—not for what she said, but how she said it. The filmmaker delivered her portion of the speech in sign language, as The Silent Child is about a deaf child and the struggles that come along with the disability. "I made a promise to our six-year-old lead actress, that I'd sign this speech," she said aloud while signing, referring to her film's star (and her co-star), Maisie Sly. "Our movie is about a deaf child being born into a world of silence," she said and signed. "It's not exaggerated or sensationalized for the movie, this is happening, millions of children all over the world live in silence and face communication barriers and particularly access to education." For a look at the whole speech, check out the video below. So where does Shenton's advocacy for deafness come from? Her father became deaf after undergoing chemotherapy treatments for cancer. Following his death, the 30-year-old worked to become fluent in sign language, and has been an advocate ever since. Interestingly enough, the filmmaker-actress also starred in the Freeform series Switched at Birth, a show that included a number of deaf characters. Shenton appeared as Lily Summers from 2014 until the show's end in 2017, which is why she may look familiar to US audiences. British audiences will remember her and Overton best for their roles on the soap Hollyoaks, as she's appeared in over 200 episodes. "Deafness is a silent disability. You can't see it and it's not life threatening, so, I want to say, the biggest of thank yous to the academy for allowing us to put this in front of a mainstream audience," Shenton concluded in her speech. Bravo to the TV alum for one of the most heartwarming and unique speeches of the evening. That's activism done right!